At powerup, DC/DC converters draw a large amount of electrical current. This inrush current can be fatal to both the converter and the load if not controlled at the beginning. 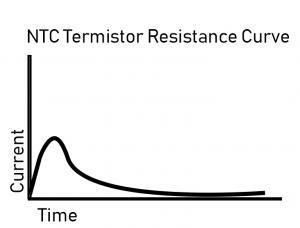 To achieve a soft start, when the electrical current rises gradually to its specified level, the use of an NTC Thermistor Inrush Current Limiter can be vital. DC/DC converters transform a source of direct current (DC) from one voltage level to another. Depending on the voltage level and converter type, you can take the original DC current source and increase or decrease it as needed. These kinds of converters can be found in many types of applications from solar power units to automobiles and more. There are a few inrush current issues you can run into when using a DC/DC converter. The converter is not equipped with an inrush current limiter. The converter is equipped with an internal inrush current limiter but is unable to handle the initial inrush of current that is being generated at powerup. The inrush current flows through the converter fine but then causes a fault once leaving the converter and hitting the load. The placement of an inrush current limiter between either the input power and the DC/DC converter or the DC/DC converter and the load gives the inrush current limiter the ability to provide resistance. When energized, the inrush current limiter self-heats causing its body temperature to rise and its resistance to lower. As the resistance drops to a low value, the current can pass through at a standard level without adversely affecting the normal operation or power efficiency, remaining at a steady-state temperature, allowing the current to flow through unaffected. You can see from the image above, when installing outboard the NTC inrush current limiter should be placed IN-SERIES between the DC power supply and the input. Alternatively, if the inrush current failure is arising on the other end of the unit, install an NTC inrush current limiter IN-SERIES between the DC/DC converter and the load, as shown in the image below. These figures are typically provided by the manufacturer. You can also see our infographic on choosing the right NTC inrush current limiter to help you calculate these measurements yourself. 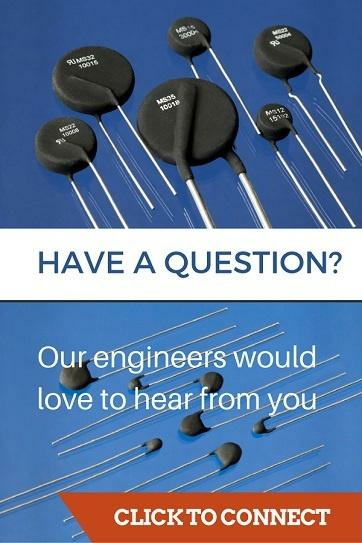 If you have any questions after reading this post reach out to one of our engineers for answers about this topic or inrush current in general. When you are ready to purchase, our trusted distributors, such as Digi-Key and Mouser, are prepared to get you the inrush current limiter you need to keep your DC/DC converter running smoothly.